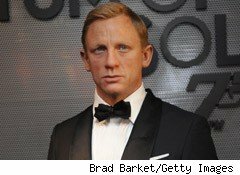 The latest victim in Metro-Goldwyn-Mayer's financial melodrama is James Bond: The 23rd Bond film, which was tentatively scheduled for release in 2011 or 2012, has been "indefinitely" postponed as a result of MGM's precarious financial position. "Due to the continuing uncertainty surrounding the future of MGM and the failure to close a sale of the studio, we have suspended development on BOND 23 indefinitely. We do not know when development will resume and do not have a date for the release of BOND 23," producers Michael Wilson and Barbara Broccolisaid in a prepared statement. Although the word "indefinitely" doesn't give much cause for hope of a finished film, Bond star Daniel Craig sounded slightly optimistic that this was just a temporary hitch. "I have every confidence in Barbara and Michael's decision and look forward to production resuming as quickly as possible," he reportedly said. No doubt the news comes as a buzz-kill for die-hard Bond fans as well as MGM execs. The Bond franchise, the longest running in film history, is probably the studio's most valuable asset, and if MGM can't churn out Bond films, its chances of improving its financial situation are basically nil. One of the few films the studio has recently released, "Hot Tub Time Machine," has grossed $42 million at the box office and cost an estimated $36 million to make. Still, a $6 million profit isn't going to put a dent in MGM's monstrous $4 billion debt. Nor is cheap to fund James Bond's extravagant lifestyle. The most recent Bond film, 2008's "Quantum of Solace," cost $200 million to produce and grossed just $168 million domestically at the box office. But MGM certainly made a profit after adding in its share of the $418 million in international ticket sales, not to mention DVD- and merchandise-related revenue. Although several parties have expressed interest in MGM, nobody has sealed a deal to buy it. The studio was expected to fetch somewhere around $2 billion, but thus far, the highest bid has reportedly come from Time Warner (TWX), and that was for the bargain-basement sum of $1.5 billion. That's a steep discount from 2004, when a partnership led by Sony bought the studio for $5 billion, about $2 billion of which went to MGM's debt. The most recent names to surface as possible acquirers were film directors Tony and Sir Ridley Scott.